Sebastian Vettel led Free Practice 2 today, completing his dominance of the Friday Free Practice sessions at the Indian Grand Prix. Vettel's dominance wasn't without a moment or two of tension for the Red Bull Racing team, however. The German triple world champion suffered KERS trouble as well as issues with brakes too. However, that didn't seem to prevent him from setting the fastest timing of the session. Vettel clocked a time of 1min 25.722secs that put him on the head of the timing charts. Clocking the second fastest time was his Red Bull team-mate Mark Webber - a repeat of the performance in FP1. 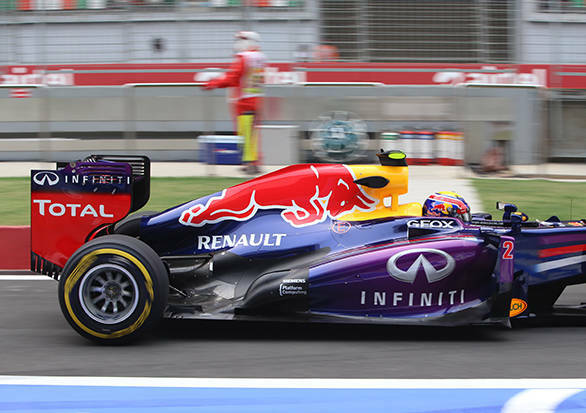 The two Red Bulls were half a second clear of the rest of the pack, with Romain Grosjean finishing third fastest. The Mercedes duo of Nico Rosberg and Lewis Hamilton finished fourth and sixth, while Ferrari's Fernando Alonso managed to post the fifth fastest time. His team-mate Felipe Massa went seventh-fastest, while Kimi Raikkonen took eighth spot on the timing sheets in the Lotus. Completing the top 10 were McLaren duo Jenson Button and Sergio Perez.